Question: In the post-Soviet period, parallel structures of other Orthodox Churches have appeared in a number of countries on the canonical territory of the Russian Orthodox Church: for example, in Estonia (Patriarchate of Constantinople) and Moldova (Romanian Orthodox Church). What is the attitude of the Moscow Patriarchate towards this? Metropolitan Hilarion: Negative. We think that where there is one Local Church, there should not be another Local Church. Therefore we do not recognize, and will not recognize, the so-called Bessarabia Metropolia as a canonical ecclesial structure of the Romanian Church, and we do not recognize the so-called Estonian Apostolic Church of the Patriarchate of Constantinople. Question: What currently is the canonical territory of the Russian Orthodox Church? Is the Church going to expand it? Metropolitan Hilarion: The canonical territory of the Russian Orthodox Church is described in its Charter. It includes Russia, Ukraine, Belarus, Moldova, Kazakhstan, Uzbekistan, Tajikistan, Turkmenistan, Kyrgyzstan, Azerbaijan, Estonia, Latvia, Lithuania, Japan, and China. Historically, the expansion of ecclesial jurisdiction has occurred due to missionary work. For example, it is no accident that Japan and China entered the jurisdiction of the Russian Orthodox Church: this was due to the fact that no missionaries from any other Local Church ever labored in these countries. Neither in Japan, nor in China, were there ever, for example, Greek missionaries. We know that in China in the early centuries there was a mission of Syrian Christians of the so-called Church of the East, after which there was a Catholic mission. But if we are to speak of the Orthodox, only the Russian Church was present there, which later granted autonomy to both the Chinese and Japanese Orthodox Churches. Therefore, both these Churches are today autonomous, but are part of the Moscow Patriarchate. Question: For several years already, the Orthodox in Abkhazia and South Ossetia, which are under the omophorion of the Georgian Church, have been asking the Patriarch [of Moscow] to accept them into his jurisdiction. Why has the Russian Orthodox Church not gone for this, although Constantinople and Romania have formed parallel structures on its territory? Metropolitan Hilarion: We proceed from the fact that a change in political boundaries should not lead to a change in ecclesial boundaries. This is the principle that the Russian Church follows in foreign policy. This is a very complicated question. It is on the agenda of bilateral relations between the Russian and Georgian Churches. This question will be resolved in direct contact between the Russian Church and the Orthodox clergy of Abkhazia and South Ossetia. We should understand that, apart from the ecclesial rules written down on paper, there are also real situations and real people: we see that there are Orthodox clergy laboring in Abkhazia who have no real connection with the Georgian Church. Mostly these are clergy of the Russian Church who were ordained in some diocese, but later found themselves on the territory of Abkhazia. Among them are both ethnic Abkhaz and ethnic Russians. To the extent that we are able, we help them, because we are talking above all about the salvation of human souls. We understand that a “holy place is never empty,” and if Orthodox mission will not be properly carried out in Abkhazia, people’s souls will either be captured by schismatics or by sectarians. I think that this problem needs to be resolved through negotiations of all interested parties. Question: Why are churches that are located abroad the property not of the Church, but of the government? What is the reason for this? Metropolitan Hilarion: Well, first, that is not entirely the case. It depends. There are churches that were built on land owned by the Russian government and that are Russian property. Such, for example, is the St. Nicholas Cathedral in Vienna, which was built in Tsarist times. It stands on the grounds of the Russian Embassy. It has always been Russian property. The same thing applies to other historical churches, as well as churches that are now being built on Russian land. But there are also a few churches that are the property of the Russian Church, but not of the Moscow Patriarchate, but of local structures within the Russian Church. Such, for example, is the Dormition Cathedral in London, which belongs to the Sourozh Diocese of the Moscow Patriarchate. Question: That is, the Church has foreign property? Metropolitan Hilarion: This is not foreign property of the Moscow Patriarchate, but structures of the Russian Church located abroad. Each of our ecclesial structures located abroad has the status of a legal entity recognized by the state and possessing ownership. Question: Why, since 2010, has there been a fragmentation of diocese? Why has it been necessary to increase the number of diocese? Metropolitan Hilarion: This process was initiated by His Holiness, Patriarch Kirill, and is connected with the fact that the church revival that has being going on over the past twenty-five years has embraced all major cities and towns, but has not always reached the hinterlands. Priests lacked the strength to work in remote areas and bishops lacked the opportunity to monitor this work properly because we have a vast country with enormous territory. Until recently, we had dioceses in which the distance from one parish to another could take five hours to cover by plane. Bishops could not cope with such territories. Therefore, as a rule, a bishop could have a complete picture of what was going on in his cathedral city and in other major cities of his diocese; but as for what was going on in the provinces, the view was often far from complete and exhaustive. The creation of new diocesan centers also gives new impetus to the Church’s missionary work, because there will be a bishop where there previously had not been one. His diocese will include parishes that were previously rarely visited by bishops, if ever. There is the impulse to create new churches. The created dioceses are united into a metropolia, and he who had previously headed this now aggregated diocese becomes, as a rule, a metropolitan. Every new diocesan bishop is independent. His diocese is an ecclesial structure subordinate to the Patriarch and the Holy Synod. The Metropolitan coordinates the activities of the bishops of the metropolia and interacts with the local secular authorities. Every metropolia has a council to which all bishops belong. All of this work is aimed at giving a second wind to the Church’s missionary work. Question: After Kirill became the Primate of the Russian Orthodox Church, a reform of the church apparatus began: new structures emerged, such as the Supreme Church Council and a number of new Synodal institutions. What was the meaning of these changes? Metropolitan Hilarion: This significantly improved the Church’s activity, because before the Synodal departments (church ministries) had worked on their own; we had no unifying body (council of ministers). Now, thanks to the appearance of the Supreme Church Council, we all know what is going on in other departments. We have formed quite a few interdepartmental projects, in which several Synodal departments directly participate. The Patriarch has a real opportunity to receive a full picture of how the departments are working. Question: Does it not seem to you that this has led to the growth of the church apparatus and of bureaucracy? The Vatican, for example, is trying, on the contrary, to make the church structure less cumbersome. And you are inflating the apparatus. Metropolitan Hilarion: But the Vatican wants to reform its apparatus in the direction of greater collegiality [sobornost’]. This is what Pope Francis has spoken about, in fact referring to the experience of the Orthodox Church. Collegiality assumes joint consultation and coordination. This collegiality has now significantly increased among us. For example, the Church recently, by initiative of Patriarch Kirill, created a new organ: the Inter-Council Presence. This is a discussion body that allows members of the episcopate, clergy, and laity to discuss pressing issues of church life, to give recommendations to bishops so that they can later make decisions at Councils of Bishops. We did not previously have this form of ecclesial participation for the laity. Question: The State Duma adopted the law “On Protecting the Feelings of Believers.” How do you feel about this initiative? In your opinion, what should be the punishment for insulting the feelings of believers, and how should this term be understood? 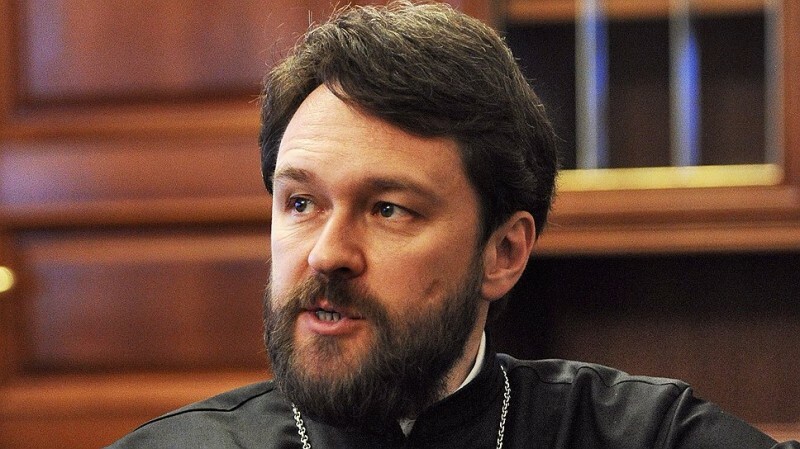 Metropolitan Hilarion: The adoption of this law was influenced by unpleasant incidents that have taken place in recent years, when churches were desecrated and crosses on graves or for veneration were broken, which is why the need for a special law to defend the feelings of believers arose. There was much speculation around this: people said that Darwin’s theory could now no longer be taught in schools, etc. Of course, we are talking about something else. We are talking about the fact that deliberate and public blasphemy and sacrilege must be punished. I do not know what the punishment should be, but I think that it should not be symbolic. I think that, on the whole, the Church regards this positively, because it raises barriers to the spread of this epidemic that has begun in recent years. Question: At the end of 2010, the law “On the Transfer of Property to Religious Organizations for Religious Purposes Under State or Municipal Ownership” was passed. Was any religious property transferred to the Church? What kind of ownership did you want to receive? Metropolitan Hilarion: Here I must say that this is in no way a question of the restitution of church property, because the property of the Church that was accumulated over the course of centuries and that was taken from the Church after the October Revolution of 1917 has never been returned to the Church in full or even in part. This is a question of objects that are already in the possession of the Church and are in use. Thanks to this law, religious organizations have the ability to become owners of these objects. This law does not prescribe any automatic transmission of objects. In each case, there will be negotiations with the relevant state or municipal authorities. The law provides an opportunity for the appropriate authorities to transfer these objects to the property of the Church. Question: Does the Church have the means to maintain all these objects? Perhaps the state wants to get rid of liquid assets by giving them to the Church? Would it not be more profitable now for religious organizations to have property at no cost, so that the state can help rebuild churches? Metropolitan Hilarion: I should say that, overall, the Church is a completely “illiquid” organization. In some sense it is always “unprofitable.” The Church has never been based like a business community to raise profits, but as a community of people ready to live not according to the laws of this world, ready to swim against the tide. This community was not by any means created for commercial purposes. Therefore the Church’s property is mostly illiquid. After all, a church cannot be sold or rented out. A church can only be maintained and repaired. And this takes place at the expense of parishioners and private sponsors. The Church renewal that has taken place in recent years has not taken place at the expense of the state budget, but on voluntary donation of the faithful and on the donations of businessmen and large companies. And such assistance was provided not only for Orthodox churches, but also for synagogues, mosques, and temples. All our traditional religious confessions have revived their structures and buildings in the same way. I think that this will continue in the same way into the future. Those properties that will be transferred to the Church will be maintained by the Church, by parishioners, and by benefactors. I think that, since this law will have no binding force for either side that, first, the Church will raise the issue of transfer of ownership of only those objects that it can maintain; and, second, that the government will likely hand over only objects, for which transfer to the Church is suitable. Question: In your opinion, can the Church engage in business in order to support itself? Metropolitan Hilarion: I think that the Church should have its own independent financial base. In every country and in every Church, depending on historical circumstances and on the contemporary context, this problem is resolved differently. For example, many Churches in the West have amassed real estate, that is, everything that they have accumulated over the centuries belongs to them. But many of these church buildings are now no longer used for their intended purposes. For example, many Catholic monasteries were intended for three to five hundred monks. Now there might be ten or fifteen monks there. In that case, buildings that the monastery does not need might be rented out as schools or other institutions, for which the monastery receives a profit. This is the financial basis allowing these Churches to exist. We have some dioceses that also subsist in this way: for example, the Moscow Patriarchate diocese in Lithuania. It has real estate that was returned to it by the law of restitution. Part of this real estate is rented, and the diocese can use this rent to pay clergy, carry out charitable projects, and restore churches. Moreover, in some countries there is the so-called church tax, that is, people can give part of their income tax – the percent that usually goes to charity or social needs – to particular church organizations to which they belong. This has its pros and cons. The disadvantage here is that some people conceive of their membership in the Church as meaning that they have to pay taxes. There are people in the West who leave the Church only so as not to pay this tax. True, they pay the tax anyway, only not to the Church, but to some other organization. But in our case, neither of these mechanisms is at work or exists. We do not have either a church tax or church property that could be used to generate revenue. And that which will be transferred to the Church will be churches and church buildings, which the Church will use for Divine services or educational needs. It follows that the creation of the material base of the Church should, in our circumstances, follow a different path. I think that there are mechanisms that have been tested in different countries and under different conditions: for example, the creation of building endowments for specific church projects. Suppose an ecclesiastical school were to be created, and businessmen invested their money in a common target capital (endowment) for its future existence and development, which would later allow the school to exist. Question: And agriculture and farming? Could a monastery dependency produce foods that could be sold? Metropolitan Hilarion: I think that is perfectly possible. We have some monasteries that have their own farms. I do not know how profitable that is now, because in today’s conditions farming is not very profitable. But, say, a monastery or seminary could have subsistence farming by providing for themselves – moreover, providing natural, fresh food. Question: What system of financing does the Russian Orthodox Church have? Is there a church budget? If so, how is it formed, what are its expenditures and revenues? Metropolitan Hilarion: There is a general church budget, a diocesan budget, and a parish budget. The general church budget consists, so far as I know, from funds received from “Sofrino,” from contributions paid by parishes in Moscow, and from diocesan contributions. These funds are then spent on general church needs. Question: This money goes to maintaining the apparatus of the Moscow Patriarchate? Metropolitan Hilarion: This money goes to general church needs. In general, the general church budget is always based on a type of mutual fund. That is, rich dioceses contribute certain sums, and then this money is transferred to subsidized dioceses. Question: On September 1 of this year, the course “Foundations of Religious Cultures and Secular Ethics” became mandatory in all schools. Vladimir Putin once said that this should be taught by “priests and theologians.” In your opinion, who should teach this subject? Are there enough priests for all the schools? Metropolitan Hilarion: I do not think that there are enough priests. But there will be enough theologians, if we educate them. I agree with the President, that a subject should be taught be a specialist in the given field. And who apart from clergy or theologians are specialists in the particular area of religion or religious culture? And I do not at all understand why in Austria, for example – where I served for six years – an Orthodox priest can come to a state school and teach the foundations of Orthodoxy to Orthodox children at state expense, while this cannot be done in Russia. I think that such teaching does not in any way violate the secular state. For example, in the Soviet period military science was taught in school, which was taught by soldiers, usually retired ones. So, in my own time, a colonel came in military uniform and taught us how to assemble and disassemble a Kalashnikov and how to use a gas mask. This did not turn the school into a paramilitary unit: he came as a specialist and wore his uniform as a specialist in his field. The same thing applies to clergy. But, of course, there are not enough priests for all the schools. Therefore, the laity should participate in this case, but those that have received some sort of teaching license from the Church. This is how it is done right now in Austria, Poland, and many Western countries. I think that this is the right mechanism. After all, now sometimes Foundations of Religious Culture is being taught by teachers who are specialists in entirely different areas, who are poorly acquainted with this subject. 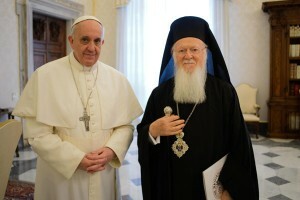 Question: What is the attitude of the church leadership towards Orthodox public organizations, such as the Union of Orthodox Citizens, the Association of Orthodox Experts, and the Union of Orthodox Banner Bearers, who organize protests, in particular, against gay parades and for defending the construction of 200 churches in Moscow? Metropolitan Hilarion: Here a more competent response could be given to you by another church agency: the Department for Church and Society. I cannot speak concretely and specifically about the attitude of the Church to the organizations you have mentioned, but in general the Church welcomes social movements and public associations that are aimed at protecting the interests of the Church and upholding traditional spiritual and moral values. It is another thing that the defense of these interests and values should be conducted in a civilized manner. And here, of course, different social organizations approach this in different ways. Question: What does the Russian Orthodox Church think about the protests by local residents of some regions of Moscow, who oppose the construction of churches in their regions? Who is behind these actions? How can this be handled? Metropolitan Hilarion: It seems to me that such actions might be instigated by enemies of the Church, or by the peculiarities of one or another place. Because sometimes these citizen actions are motivated by cases, for instance, when the construction of one or another church facility would deprive residents of a park, a place for walking, or playgrounds. But in such cases, decisions are always made that take the interests of citizens into account. As far as I know, there have already been several cases when they planned to build a church in one place, and later it was transferred to another, because the residents of the original place were of a different origin. These questions need to be resolved through negotiations, which is now underway. I see absolutely no potential here for conflict. The Church will never enter into conflict with society and residents. Everyone’s interests will always be taken into account. Question: How has the makeup of believers in Russia changed in comparison to the 1990s? Has it increased or not? Has the social composition of believers changed? Metropolitan Hilarion: First, of course, the number of Orthodox believers has greatly increased. There are many times more. Second, there are more young people in the Church. Third, if we are to speak of social classes, it seems to me that the contemporary Orthodox Church represents all social strata. These are people of different incomes, educational levels, and professions. Today our parishes, in this sense, represent a very mixed picture. But I think that this in fact witnesses to the fact that the Church unites all people regardless of their age, gender, and social status. It is interesting that this is the way it was before the revolution when, for example, prisoners in shackles were led to church, where they stood in church next to representatives of the aristocracy. The Church has always been open to one and all. Question: Why then, as the number of believers has grown, has the number of acts of vandalism likewise increased, to the point that it is necessary to make laws protecting believers’ feelings? Metropolitan Hilarion: Perhaps it is that, or perhaps there is another explanation: that the struggle between good and evil, between God and the devil, is exacerbated when the Church is having such clear success, winning clear victories. This has been the case more than once in history. When the Church was persecuted in the first three centuries of Christianity, there also arose, of course, both heresies and schisms, but they were of a local character. As soon as the Emperor Constantine set the Church free following the adoption of the Edict of Milan in 313, the heresy of Arius immediately began to spread. Already in 325, an emergency meeting was convened that was later called the First Ecumenical Council. It was not a planned event; it was an emergency meeting convened to save the Church from heresy. And the Council did not put an end to it. It was after the First Ecumenical Council that the Arians seized power in the main cities of the Eastern Roman Empire. And then there was need for another Council, in 381 – the Second Ecumenical Council – which again condemned Arianism. That is, we see that when the Church emerged from the catacombs, when a new page opened in its history, the devil immediately went on the offensive. With us, too, the 1990s were marked, on the one hand, by an unprecedented flowering of church life and the construction of new churches; but, on the other hand, it was in the 1990s that all those schisms began that still have not been healed, including the one in Ukraine. Question: How does the Russian Church relate to the way in which Pope Francis is promoting simplicity and modesty in everyday life? Some people even try to use the Pope’s modesty to reproach our own bishops. Metropolitan Hilarion: Which is fine. One can only welcome this. 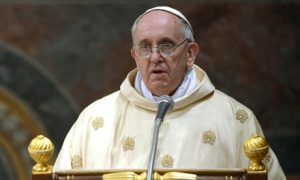 The most important thing is that God’s work be done, so that the head of a Church give himself wholly to church affairs. I think that this is what is important, and not everyday details.